Endermologie (Vacuum Massage) is a new efficient and safe way to get rid of cellulite and reshape the body without surgery. Each treatment session of Endermologie lasts 15-60 minutes. Two - three sessions per week are needed. After reaching the desired results, patient is advised to continue treatment once a month to keep good shape. Endermologie (Vacuum Massage) stimulates natural body mechanism of removing excessive toxic substances from the body to regain shape and elasticity leading to remarkable thinning of the treated area. Endermologie is very safe and effective it offers a natural alternative solution to sophisticated medications. 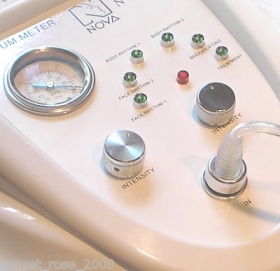 Endermologie (Vacuum Massage) treats cellulite in a mixture of massage and suction to re-distribute connective tissues of skin and activates blood and lymphatic circulation to expel toxic materials. The outstanding results are documented with measurement taken before and after treatment. A decrease of 1-2 numbers of usual dressings is expected. The best is that desired changes take place at the area you treat exclusively without affecting other areas e.g.